The menisci are important load bearers and shock absorbers in the knee. If meniscal tissue is torn and/or trimmed, then the more meniscal tissue is lost, the less of a shock absorber there is in the knee and the more likely the patient is to end up getting increased wear and tear in the joint, and eventually arthritis. If a large amount (>50%) of meniscal tissue has been lost and if as a result a patient is developing specific symptoms and problems from this then meniscal replacement surgery might be indicated. 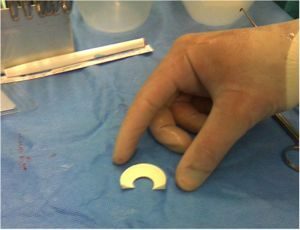 If the peripheral meniscal rim is fully intact, then the missing meniscal tissue can be replaced with an artificial bioabsorbable meniscal scaffold. Meniscal scaffolds can be stitched into place in a knee. The patient’s cells grow into the scaffold and new meniscal tissue is formed. Some studies have shown that implanting a meniscal scaffold can decrease a patient’s pain levels, increase their function, keep their knee going for longer and reduce the number of further repeat knee operations that they might need subsequently. Other studies have shown poor results, with shrinkage and tearing of the meniscal scaffolds and a poor growth of new meniscal tissue. Overall there is currently only limited clinical evidence to support the use of meniscal scaffolds, and there is a strong argument that if enough meniscal tissue has been lost to justify replacement, then the best thing to replace a missing meniscus is actually a proper new meniscus – i.e. meniscal allograft transplantation. The meniscal cartilages are important load bearers and shock absorbers in the knee. Meniscal tears are the most common knee injury presenting to a knee specialist. Unfortunately, most meniscal tears are not repairable, and only 25% can be repaired (25% in the hands of a specialist knee surgeon with a particular specialist interest in meniscal surgery … probably considerably less than 25% in many other surgeons’ hands). 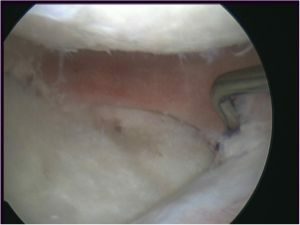 If a meniscal tear is symptomatic enough to justify surgery but at the time of an arthroscopy it is found not to be repairable, then the only remaining option is to trim away the torn tissue, leaving behind a smooth and stable surface. If only part of the meniscus is trimmed then this is called a partial meniscectomy. If the whole meniscus is removed then this is called a total meniscectomy. The more meniscal tissue is trimmed, the of a shock absorber is left in the knee and therefore the greater the forces will be on the articular cartilage layers covering the bone surfaces of the bottom of the femur and the top of the tibia on that side of the knee. With time, this leads to pressure overload to the articular cartilage, with increased wear and tear. Eventually, the articular cartilage may wear thin and then ultimately wear away, leaving bare bone exposed in the joint. Bare bone rubbing on bare bone causes the severe pain that is associated with arthritis. Not every patient who has had a partial meniscectomy will actually go on to suffer further problems in their knee. However, some will – and if a patient with a previous partial meniscectomy does actually start to develop increasing symptoms of wear and tear in their knee (pain, swelling, stiffness, decreased function) then they might be an appropriate candidate for meniscal replacement surgery. If the whole meniscus has been removed, or if there is any discontinuity in the peripheral meniscal rim, then the only viable option for meniscal replacement surgery is to have meniscal allograft transplantation. This is where a whole intact sterilized meniscus is taken from a donor (an organ donor) and implanted into a patient’s knee. The results are very good. However, this is a fairly large and complicated procedure. 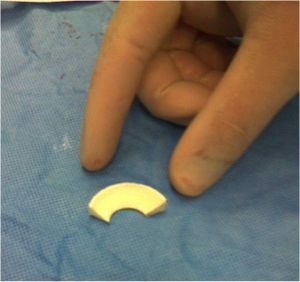 If, however, only part of a meniscus is missing and if the peripheral meniscal rim is still intact but the patient is still developing problems, then they might be appropriate for an artificial bioabsorbable meniscal scaffold instead. The advantage of this over meniscal transplantation is that it is a somewhat smaller and slightly easier operation. Whereas meniscal transplantation involves small open incisions and tunnels being drilled into the bone of the tibia, meniscal scaffolds can be put into the knee and fixed arthroscopically (through fully keyhole surgery), and the surgery is comparatively somewhat easier and less invasive. There are currently two main meniscal scaffolds available in the UK. The first is the Menaflex Collagen Meniscal Scaffold. This is made from bovine (cow) Achilles tendon with all the cells removed, and with the collagen fibres heat and pressure molded into a meniscal shape. The second is the Actifit Scaffold, from Orteq. This is made from polyurethane. The Actifit is more robust and solid to handle, and easier to insert into the knee joint without damaging the scaffold. The operation is performed under a General Anaesthetic with a 1-night post-op stay in hospital. First, an arthroscopy is performed and any residual damage in the joint is tidied up. 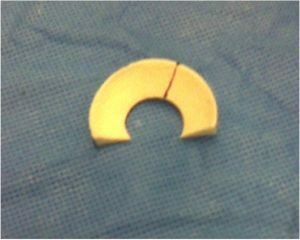 Then, the meniscal rim is tidied up and freshened up and the size of the meniscal defect is measured. The scaffold is then taken and cut to size/shape. 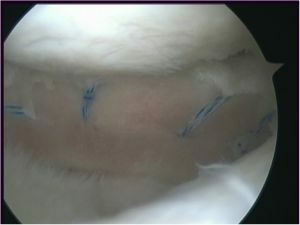 It is then inserted into the knee and stitched firmly to the meniscal rim using multiple meniscal sutures. 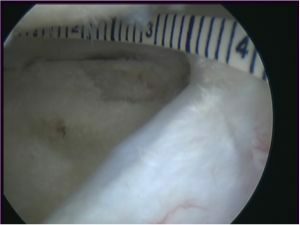 Patient’s lateral compartment with most of the lateral meniscus missing (from a previous major partial meniscectomy), but with the peripheral rim intact. The articular cartilage on the femur and the tibia are showing signs of significant degeneration (early arthritis). 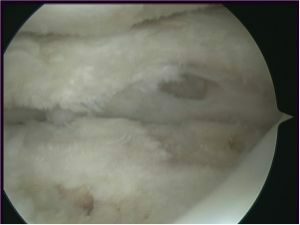 The meniscal remnant is tidied up and the gap where there is missing meniscal tissue is sized. A meniscal scaffold is taken. The meniscal scaffold is marked to size. The meniscal scaffold is then cut to size. The scaffold is inserted into the knee with a special curved clamp. The meniscal scaffold is then fixed in place with multiple meniscal sutures, all done through arthroscopic (keyhole) surgery. After implantation of a meniscal scaffold, the knee needs to be protected, to allow the scaffold to heal into place safely. I normally therefore keep patients in a hinged knee brace (initially locked at 0 to 45 degrees flexion) and partial weight bearing with 2 crutches for the 1st 6 weeks. This is then followed by 6 weeks of regular physio rehab sessions, to get the movement back in the knee. However, I advise patients to avoid deep loaded squats, lunges, loaded twisting, heavy weights or impact for a full 9 months after this kind of surgery, to allow the meniscal scaffold to heal in and mature fully before it is stress tested. If you can’t commit to the rehab required, then you shouldn’t undertake meniscal replacement surgery! The results of meniscal scaffolds have to-date been equivocal. 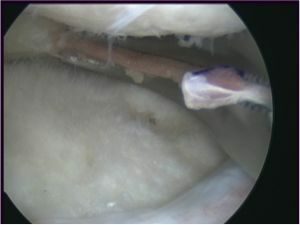 Some studies have shown that about 75% of the missing meniscal tissue grows back into the scaffold and that the scaffold material is slowly absorbed, with ingrowth of new ‘meniscus-like’ tissue. Some clinical studies have shown that meniscal scaffolds reduce patients’ pain levels, increases their functional levels and decreases the number of repeat knee surgeries that they might need subsequently. Importantly, however, there are other studies that have shown high failure rates, with shrinkage, fraying and tearing of the scaffolds, and with a high rate of re-operation. In the longer-term, I am sure that the future of meniscal replacement surgery lies in 3D-printed biological scaffolds and tissue engineering, with cells and growth factors being pre-seeded into biological scaffolds with enhanced incorporation and with regeneration of proper functional meniscal tissue. Unfortunately, however, the reality is that we’re simply just not there yet! My personal opinion is that if you’ve lost so little meniscal tissue that a meniscal scaffold is technically a viable option, then you probably don’t actually need the surgery… and if you’ve lost so much meniscal tissue that you do actually need meniscal replacement surgery, then the gold-standard is still meniscal allograft transplantation — currently, there’s just nothing out there for replacing a meniscus that’s actually better than a real true (donor) meniscus.